Either way, it's great to be back in the US, in southern Idaho, the beautiful high desert of Owyhee County. I'm not sure what exactly was the best part of getting back: emptying the suitcase (! ), or wearing different clothes (! ), or getting back in the saddle (!!). My first day back I grabbed Steph's awesome horse Rhett, who took me for a splendid ride along the Rim Trail over Hart Creek. This is mine and Rhett's favorite trail. He knows where we're going, and I let him decide what he wants to do. He was into it as much as I was - it was a Welcome Back ride. 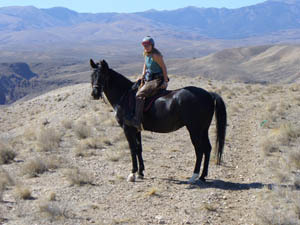 We trotted along the winding trails, cantered up the hills, galloped up roads and along the grassy flats, strolled along the rim admiring the view, ripped along cow trails through sagebrush, stopped to watch a jeep of hunters drive down a road, galloped along the Pickett Creek Rim and cantered back home. Rhett is the coolest horse. Everybody who gets on him says the same thing. Neighbor Carol calls him her "10 horse. 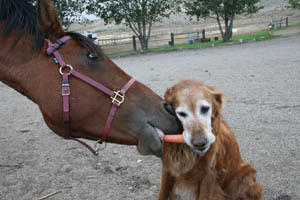 He's the horse I compare every other horse to." I haven't quite gotten around to putting away the clothes I unpacked from the suitcase yet, and I haven't quite pulled out the fresh clothes I'd stashed away while I was on the road. 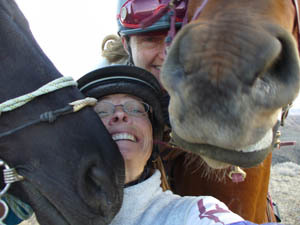 Haven't had time because I've been riding every day - getting myself back into riding shape, and the Teeters have a 5-day ride coming up starting Tuesday - and a riding friend from Seattle, Connie, showed up to ride and enjoy the great outdoors here. The weather turned blessedly cool the day I landed in Boise, and got colder over the weekend, imposing blue storm clouds over the Owyhee Front Range to the west, dropping a night's worth of rain (first good rainfall since spring), and a covering of snow in the mountains.